The red fronted serin is like a mysterious guest at a fashionable party: striking dark looks; an enigmatic past; the subject of whispers and rumours; everyone is intrigued, yet no one seems to know much about him. He is the Jay Gatsby of the serin world. The fascination with the red fronted serin stems from speculation that it may have been involved in the creation of the Lizard canary. It has all the ingredients of a classic mystery: it happened a long time ago in a foreign land; something strange happened, but there are no eye-witness accounts or written records; all we have is circumstantial evidence and our imagination. It is an exotic mix that Scott Fitzgerald would have enjoyed. If true, it would explain why the Lizard looks so different from every other breed of canary; but is it? Arguably the most attractive, and certainly the most distinctive, member of the serin family, it is surprising that the red fronted serin (Serinus pusillus) has never become widespread in aviculture, let alone domesticated. Its habitat stretches from Turkey, through Syria, and along the Himalayas. It was known to French ornithologists in the eighteenth century – Buffon describes it Histoire Naturelle des Oiseaux – and it is highly likely that specimens would have been available in the bird markets of Paris. The French connection is important, because that is where the legend was born. 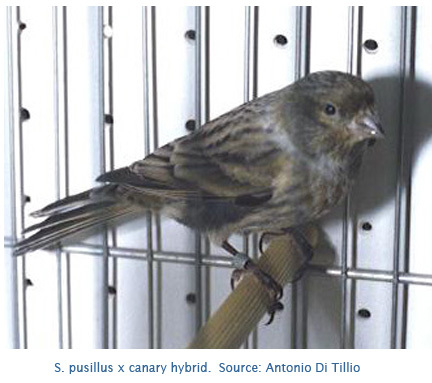 We know from Hervieux that hybrids between the canary and various finches were being produced in the first decade of the century, so it would be no surprise if similar attempts were tried with the red fronted serin. 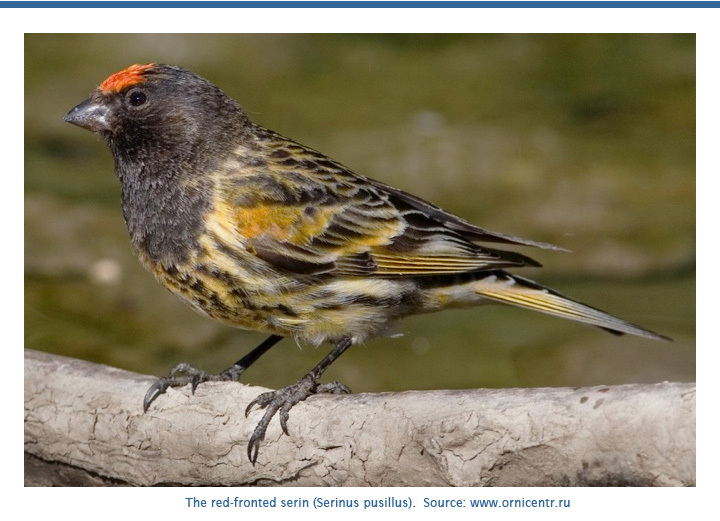 Both being serins, the chances of fertile offspring would have been good (certainly better than those from the canary and the red hooded siskin, which created the red canary). Assuming that French breeders produced fertile hybrids between the two species, the conjecture that they were the ancestors of the Lizard canary is based on the simple fact that the red fronted serin and the Lizard canary have many features in common. 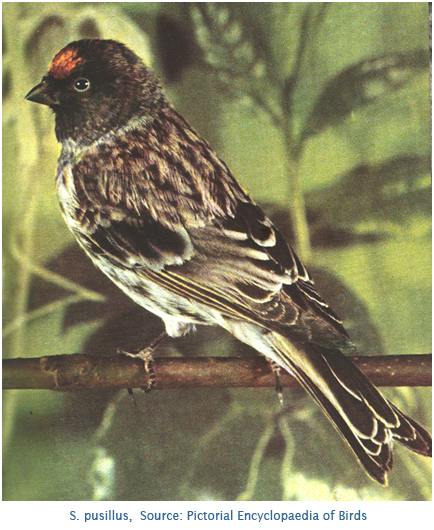 The red fronted serin is the only close relative with a distinct cap; its wings, tail, legs and beak are black; the breast markings have similarities to rowings; and the ground colour can be luminous. Some specimens even show spangle-like markings on the back. Sounds quite convincing, doesn’t it? As so often happens, the headlines conveniently overlook some awkward facts. 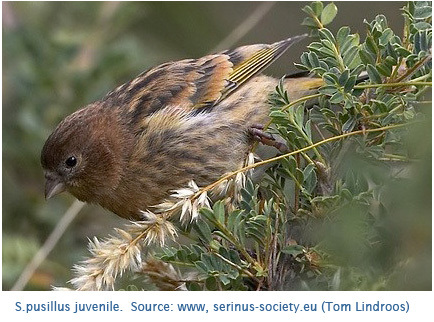 The cap changes with age: it is not visible in juveniles, then appears as a brownish cap in immature birds before becoming red in the adult breeding plumage. By contrast, the Lizard’s cap is fixed throughout its life, and is a yellow or buff colour. The black on the face is dense and extends onto the breast and shoulders. It is finely striated in the Lizard. While some specimens show markings similar to spangling, the markings on the backs of Serinus pusillus vary considerably: from black suffusion to coarse streaks and distinct lacings. The following photograph is a fair representation of what I have seen in living specimens. Modern hybrids between the Red Fronted Serin and the canary tend to be dark coloured ‘self’ birds. They look nothing like the Lizard. The metabolism of carotenoids, which create the yellow and red pigments in birds, in S. pusillus is quite different from that of the Lizard canary (contrary to what you may have read in Cage & Aviary Birds recently). None of these inconsistencies fundamentally invalidate the red fronted serin hypothesis, but they are significant drawbacks. I will return to this story in future posts, but in the meantime we can be confident that the rumours will persist, and no doubt embellished with every telling.